Just a quickie today – my first post from my Samsung Galaxy Note 3! I have been loving all of the ‘back to school’ pictures on Facebook and thinking about how fast it has flown for us … my boys are going to be a junior and senior in high school! We’ve done loads of college visits, ordered Danny’s senior pictures, and will be starting the application process soon. Wow … hard to believe that the picture at the top is just from Danny’s freshman year. And since I have all of my iPhoto library automatically upload to my Google drive, I am able to peruse my whole mega-photo library on the Galaxy Note! So I dug back to pictures I had scanned in way back in Massachusetts, and found one of John and I together as kids, and based on the photos around it could very well have been a back to school picture. This entry was posted in Family and tagged Family, Samsung, School by txa1265. Bookmark the permalink. I just started my second year of college myself. And i have been considering joining a fraternity and i remember seeing a post of yours about a fraternity you were in. I just wanted to know if you would recommend it and what the experience was like. I want to push my comfort zone this year and it seems really appealing to me. I think it would help me make some great friends and take part in some awesome stuff. I’ll probably be going to the rush events for some of the fraternities at my school. But do you think that joining one made your college experience better? Sorry I am just seeing this Nick … I think joining a fraternity is a personal choice. For me, I had no intention of joining, but had a good friend and he and I went to all sorts of places, and there was a huge Greek community on campus … so we joined. For me it was one of the best decisions I made – it helped me, and I made a difference in something bigger than myself. I was able to see that reflected back at me at the reunion I went to in April … it has been more than 25 years since I graduated, and there are still impacts from things I did during my time. 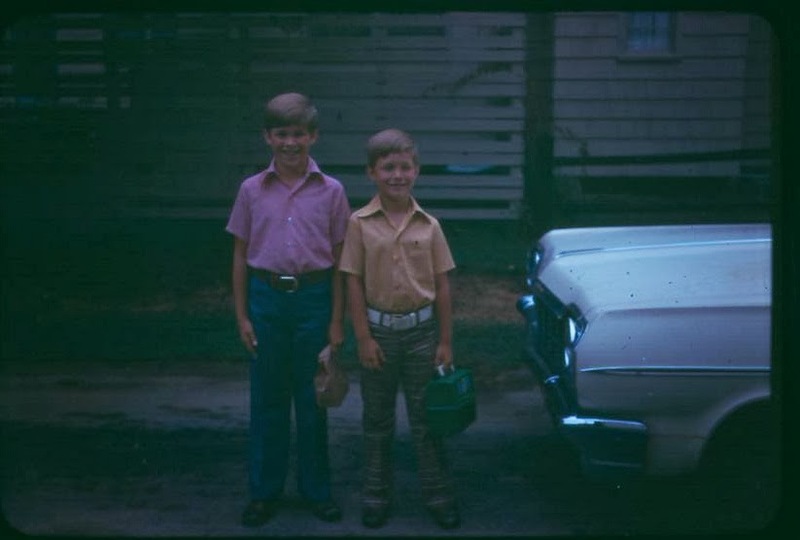 Love the picture of you and your bro as kids, and LOVE the car. So fun! I love looking back on old pictures. I still have so many that haven’t been scanned into the computer, but my dad has been really good about uploading all the family ones and got most of them done before my wedding 2 years ago. I have always been such a picture person and I think its so cool that now they can all be saved in one place! Happy back to school for the boys! I love the old pic of you guys, I have some funny ones of me and my sister too! Thank GOD Facebook didn’t exist when we were kids..I had so,e seriously terrible haircuts! Here’s to a great school year for both the boys (and you and Lisa too!) I loved the pic of you and your brother. I love that my Google Drive is a repository for all the pics that I take too, I really love looking back, especially over the past 2.5 years and seeing all the changes in Ashton as he grows up. I find myself saying a lot, “I can’t believe he was so tiny!” As much as I look forward to him starting pre-school next year, I think with that will come a lot of tears too! HA! Have a great weekend! Neither of our boys looked back on the first day of preschool … there were still kids clinging and crying in December – ours were the total opposite (somewhere in the middle would have been nice!). 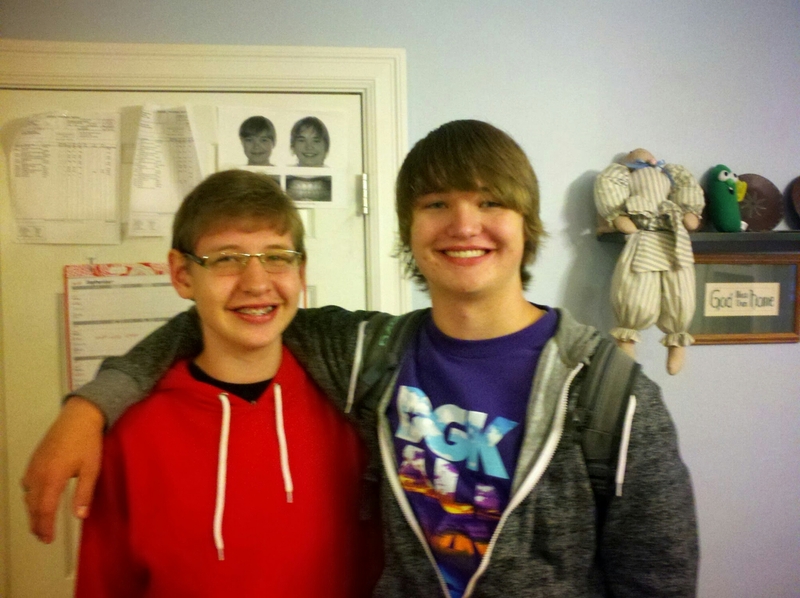 And it is amazing how the years fly by – our older son is a senior and helping out with ‘freshman first day’ today … it seems like yesterday HE was a freshman! So cute! And you have the same smile!